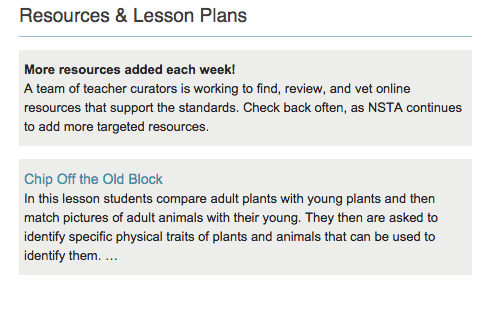 Perhaps you are like me and for the past several months you’ve been checking the Next Generation Science Standards on the NSTA site. You click on a standard and then scroll to the bottom of the page to a section titled Resources & Lesson Plans and you see… Coming Soon! Well today I clicked on a standard, scrolled down… and there was a resource posted! This is very exciting. The NSTA NGSS Curators have been working hard to identify vetted NGSS resources and some things are being posted. I recommend visiting the NGSS@NSTA site and poking around a bit. The formatting of the site and inclusion of instructional resources provides a much different resource than Nextgenscience.org.